The best thing about fishing in Florida is there is always something biting no matter the time of year. Visitors to Florida's Space Coast can find fishing oppportunties for a variety of species. Ponce Inlet, Indian River Lagoon, and Mosquito Lagoon fishing charters with Capt. Lemmon are available during all months of the year. 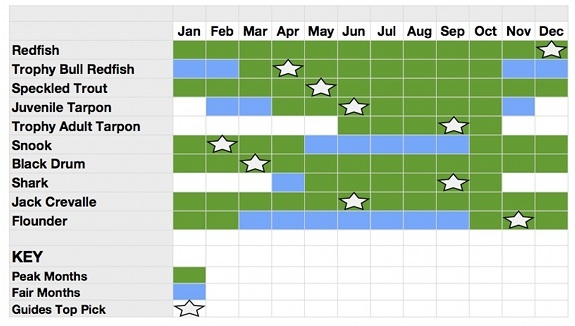 See the table below to get a better idea of what's biting during the time of your visit.